“Joy” reunites Jennifer Lawrence with director David O. Russell’s stock players, including Robert De Niro and Bradley Cooper. Russell won me over with “The Silver Lining Playbook” and “American Hustle,” so “Joy” arrives with high expectations. It is with some regret, I have to tell you “Joy” doesn’t come close. It's based on the story of Joy Mangano, a single mother with a talent for inventions. The real Joy Mangano came up with the idea for the Miracle Mop, a self-wringing mop with a detachable head you can put in your washing machine. Great idea. Mangano went on to sell thousands of these on the QVC network, and ultimately morphed into a clearing house to manufacture “why didn’t I think of that” ideas. In the movie, Lawrence must put up with and take care of a highly dysfunctional family, including a divorced father (De Niro), a non functioning mother (Virginia Madsen) a ne'er do well ex-husband living in her basement (Edgar Ramirez) and a jealous half-sister (Elisabeth Rohm) all of whom seem to go their best to undermine Lawrence. The crazy family overwhelms the movie, even if they are often entertaining to watch. Russell recreates QVC and makes a terrible mistake casting Melissa Rivers to play her mother. It rings false from the moment Melissa as Joan comes on screen. At that moment, “Joy” starts to unravel. Toward the end of the story, Russell appears to run out of time, throwing a quick wrap of a finale which undermines the story. I’ll still look forward to David O. Russell’s next movie. 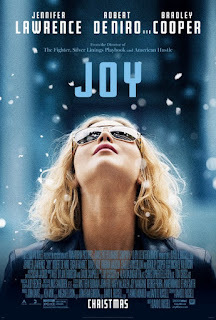 I’ll still look forward to everything Jennifer Lawrence does; but “Joy” misfires. Does it deliver what it promises? Many of the actors from “American Hustle” and “The Silver Lining Playbook” reunited. Is it entertaining? At first, but falls flat. Is it worth the price of admission? Mixed result.